California Chrome has proved to be a gamer in the Kentucky Derby and Preakness, grabbing the first two legs of horse racing’s Triple Crown for three-year-olds most regally. The Belmont Stakes to come is the toughest, I thought, as I spied another batch of horses moving in circles Friday night in Syracuse. Given the opportunity, could any other of these ponies be able to match California Chrome in character? Would somebody be able to take their place on top of one of these creatures and go for the brass ring? Older than California Chrome, but filled with spirit, this indoor Painted Pony. I took a look at an outlier in the center ring, without a mount. I decided to call her Painted Pony. In my youth, I rode the likes of Painted Pony to many a great finish. Painted Pony had friends on the short track with riders aloft. They were noisy, waving to watchers as they sped by. They were in a bunch, ready for a photo finish. 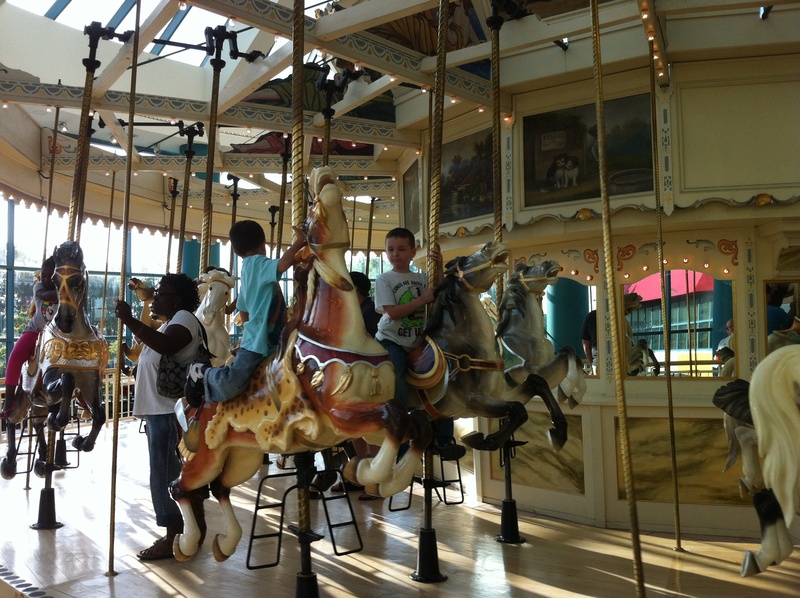 Syracuse’s mega shopping, dining and entertainment complex Destiny USA started its existence as Carousel Center, with a highlight ride here in the food court. 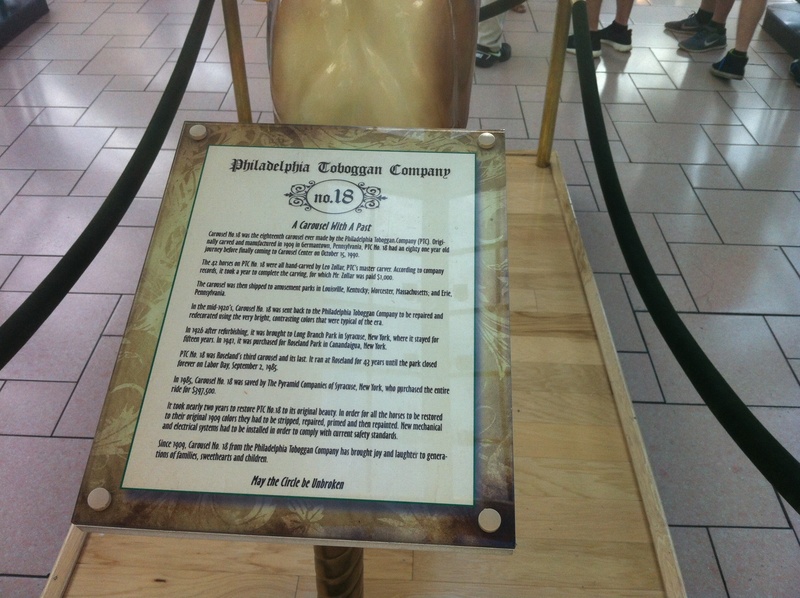 This plaque talks about the history of this ride. Here’s the source for the photo of California Chrome. Are you a fan of the merry-go-round? Where was your favorite carousel ride? Do you still bring kids or grandkids to ride? 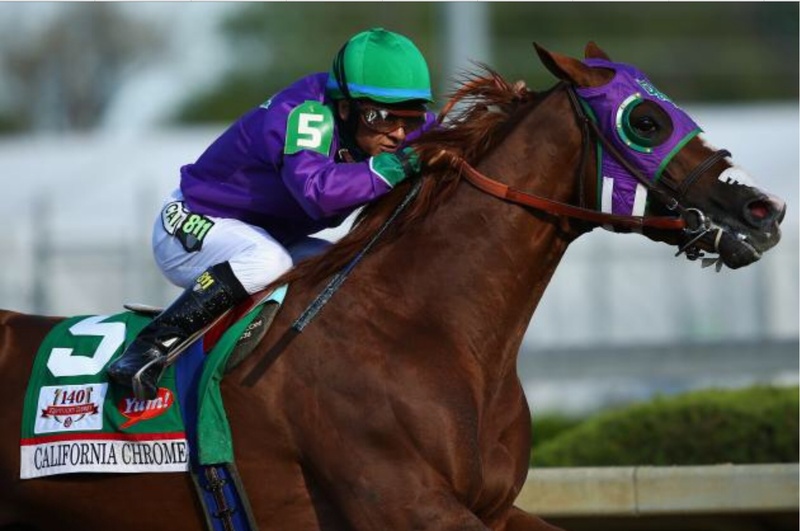 Will you be rooting for California Chrome to win the Belmont Stakes and the Triple Crown next Saturday? Would you throw two bucks down on a horse named Painted Pony? And the race is on and here comes pride up the outside… Ha! I’d love to ride Painted Pony – you go first! I’ve never been to a horse race. I had an “uncle” (some complex relationship whereby he married my mother’s mother’s brother’s ex-wife – too complex for a lttle guy , so he was called “uncle”) years ago who had race horses. The last of a long family line. They were beautiful and so high strung. He also had some Clydsdales and work horses. I preferred them – they were friendlier, slower moving and happier; much better around a kid like me. They’d always come over to see me when I arrived, looking for carrots and a pat. The business had a long history of cutting ice on the Dartmouth (Nova Scotia) lakes before refridgerators. That was when my Mum was a young girl (about 70 years ago). The ice horses, as they were called spent all winter hauling ice from the lakes into storage in big barns and then spending all summer delivering ice around town.It was said that they knew the routes and routines so well that the driver could just let them go and they would make all the necessary stops without his intervention. Anyway, horses I love, race horses seem to me to be man-bred for one characteristic and having negative personalities. Neat post Mark – brings back memories. I have watched the horses race, with saddles and jockeys, including at the toney Saratoga during Travers Stake week here in upstate New York, and from the crowded infield at the Preakness when I lived in Maryland. I also have watched the trotters and pacers, which pull the riders on a sulkie, the little cart, behind them, here at Vernon Downs, 30 miles from Syracuse. I have petted a live horse. One of my best friends, Greg, his lovely wife, Carolyn, raised horses, and she allowed me to stand next to her beautiful Proofreader in their stable. I was in awe. But I have never ridden a live horse, and don’t really wish to, Paul. Not built for it, I don’t think. I did like the Painted Ponies of the world back in the day. Thanks for sharing your great memories, my friend. I can hardly wait for the race. Here’s hoping my California Chrome is ready. I love merry-go-rounds and amusement parks. My favorite amusement park ride is the Wild Mouse. I don’t enjoy, so much, up-and-down rides like roller coasters (unless they’re at Disney World). I don’t bet on anything except sure things, so I wouldn’t put money on a horse race. But I would bet on any post of yours, Mark. i hope the painted pony wins! 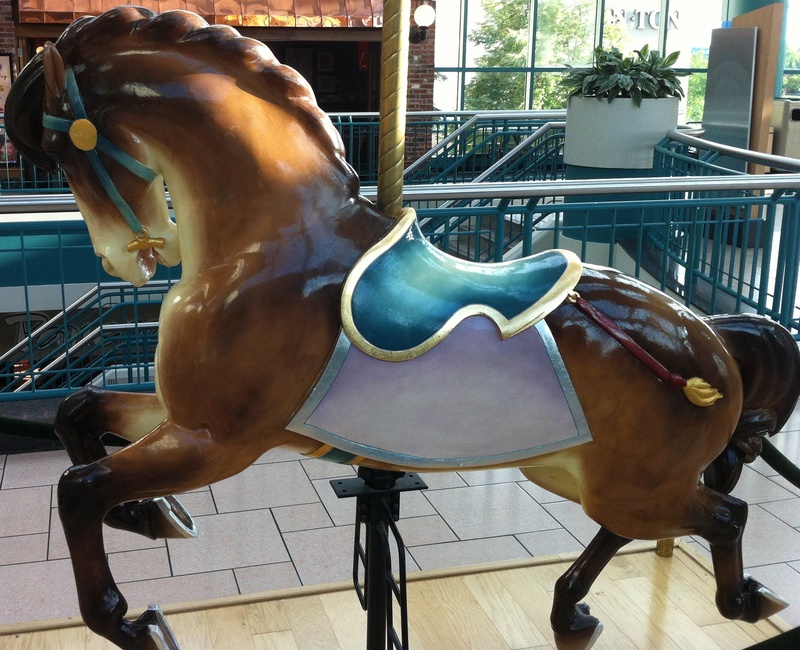 i love the art of the carousel, and used to love to ride them, however i cannot even look at them now when they are moving, as i get nauseous on spinning rides ) as for real horses, i enjoy riding, but haven’t been on one in a while, perhaps it’s time…. Ah, the spinning ride thing. I won’t even try because of that, Beth. Same fear now. I used to fearlessly ride roller coasters but get sick in a rowboat. Go figure. Riding a horse is just too daunting to me. The horse is so big and willful. I had trouble this morning with my photo-loading, too. My previews showed white boxes with caption, like five times. Then all of a sudden it was fixed. Even my Reader is acting up on me, tossing me off saying server not available when I click to read somebody say, one out of every four times. WP is in doo-doo today! good to know it’s not just me, i’m the worst tech person on the planet, so not good at troubleshooting. hopefully they’ll get it together soon, the stories are building…….. I like the news that you have a lot to post. Yes! I love am old fashioned merry go round – they always make me think of the Mary Poppins film. 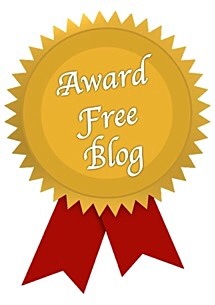 This merry go round is a nice one, too, Rachel. Very big and colorful. I love that carousel. I have not rode one in so long. It is nice to watch it, though, right, Chris? It is. It’s humbling and hypnotic. Whether you have memories attached to a certain one or not, a ride creates a whole new world.